Here’s a few photos of a fifth grade classroom with a patriotic theme. Big bold letters over the window are visible from the moment you walk in and make a great eye-catching visual. Bandanas on the wall gives a punch of color to the back of the classroom, while doing double duty of covering up a dingy wall. Felt on chair and desk legs cuts down on noise with new tile floors. We used red on chairs and blue on desks so when one comes loose students know where to look. Red, white and blue supply tubs for each student. Name plates have patriotic stars on them (hard to see in photo). This hangs outside the classroom door so students fist bump it on their way in to learn. Like a champion, that is. School theme this year was “superheroes” but in keeping with the patriotic/Texas theme of the classroom, the hallway display I created was “My Heroes Have Always Been Cowboys”. This Library of Congress sign hangs over the classroom library bookshelf. The Vice President sign hangs over the ViP desk. One student is selected to be the VP of the day. Vice President of the day is a student selected by the teacher for a job well done. Student writes their name on the frame with an Expo marker so it can be wiped clean for the next VP. The VP desk – located in the back of the room – has fun pens, pencils and supplies in it. It’s an actual teacher’s desk that isn’t being used by the teacher. The class created a flag mosaic using painted popsicle sticks to help decorate behind the “oval office” (aka the teachers desk). I made the placemats from wrapping paper ($1 per roll at Dollar Tree). 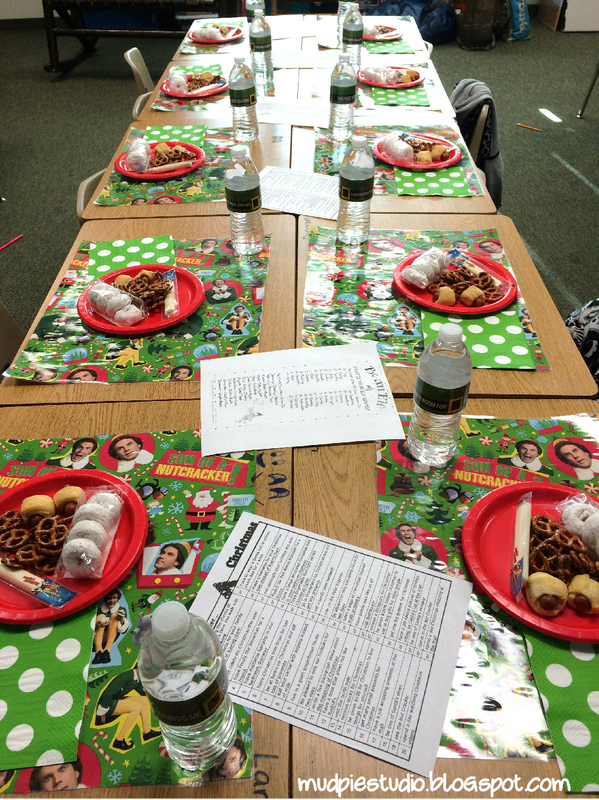 On the tables were “Be an Elf” and “Christmas Would You Rather” sheets to keep the kids entertained while they ate. Everyone loved the Elf names - even the parents! The party was at 10am, so we had donuts, pigs-in-blankets, cheese sticks and pretzels. 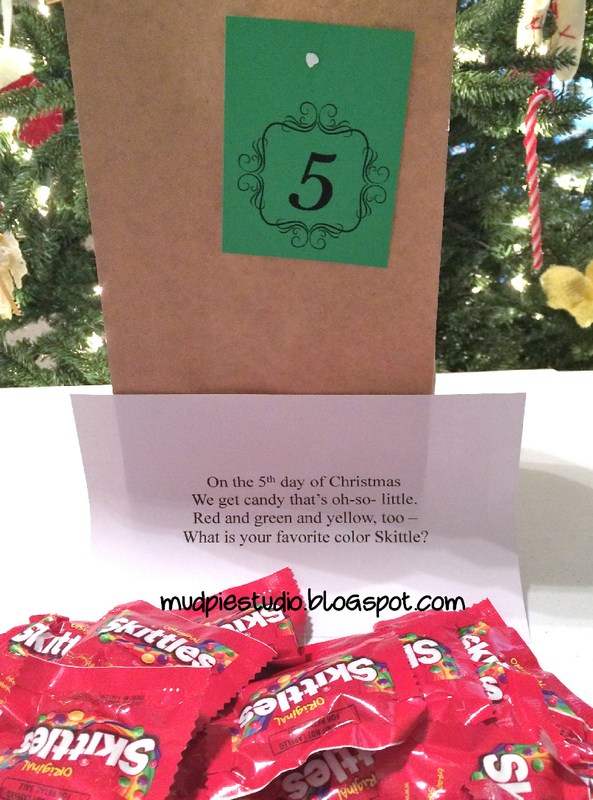 After the kids ate, we played “Elf Four Corners”. This was an easy, fun and FREE game that everyone loved! One kid is “the caller” and they turn their back on the room. All the other kids then get up and move to one of the four corners. Every corner has to have at least one kid in it. The “caller” then says stop and announces one of the four corners and turns around to face the room. Everyone in that corner is now OUT and they must sit down. Play continues until there is only 1 kid left and they are the winner. We played three rounds of this game. Each round lasted about 8-10 minutes. The kids loved this game! Thanks for checking in! Have a Merry Christmas! 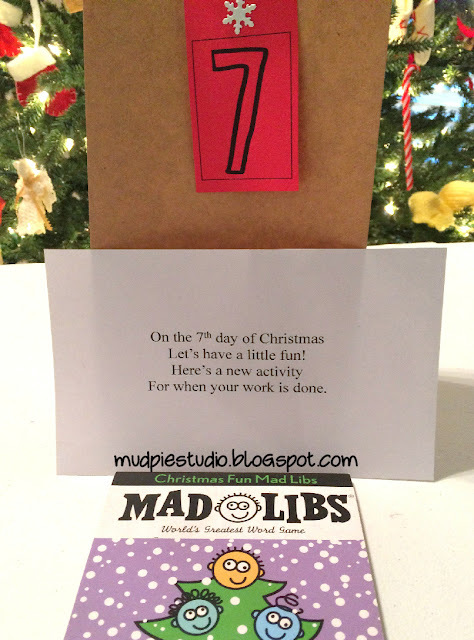 So a few years ago I published a 12 Days of Teachers Appreciation Gifts, and this year I decided to create one for all the students. This was a great way to detash a bunch of leftover Halloween candy as well as some supplies in my craft stash, so it was a win-win for everybody. 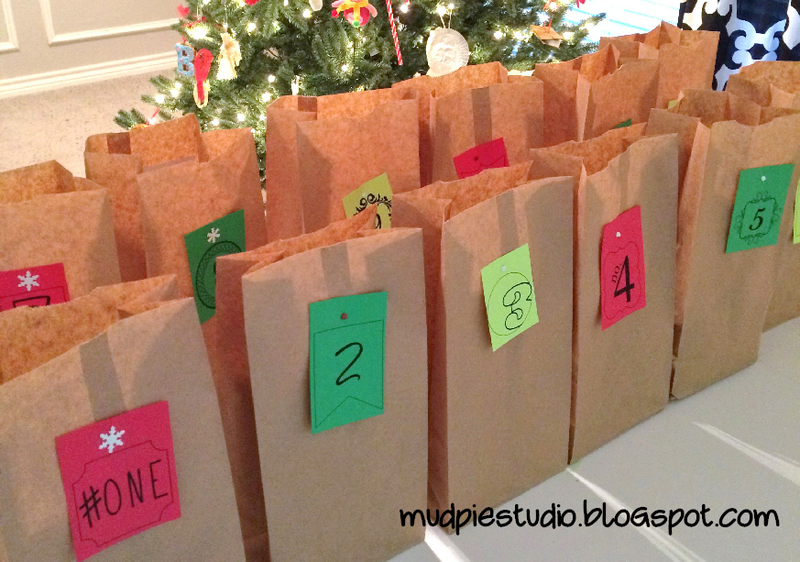 I started with 12 brown paper lunch sacks with colorful tags marked 1-12. 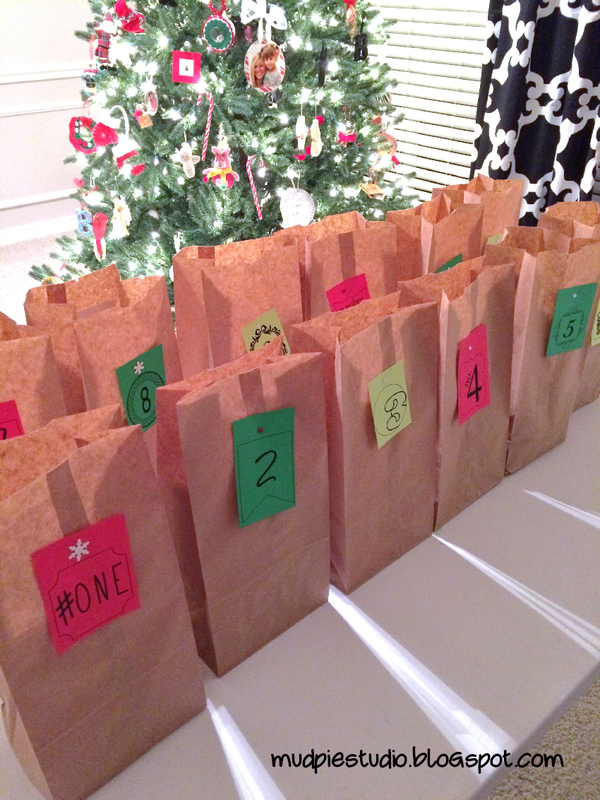 In each bag, I put either one gift for the class to share, or 23 identical items (one for each student plus one for the teacher). 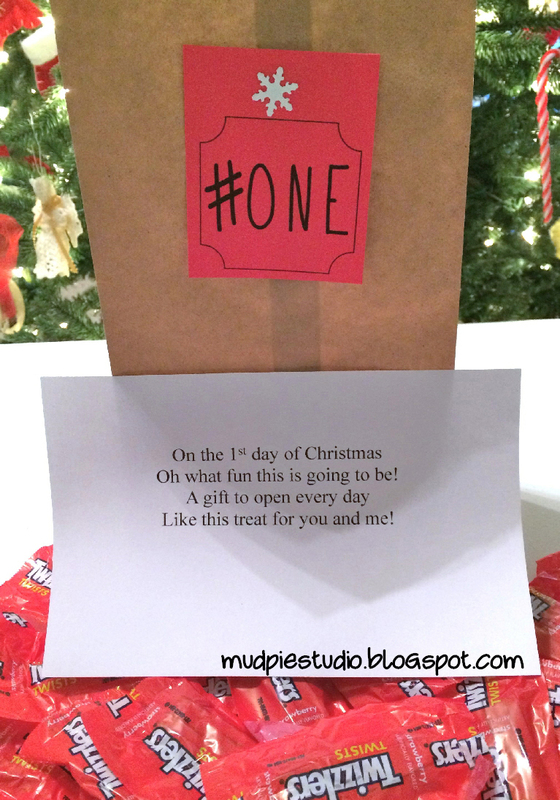 Also included in each bag was a four-line poem that started with “On the 12th Day of Christmas…” and so on. Yep – day 1 was candy. Leftover Halloween candy, to be precise. 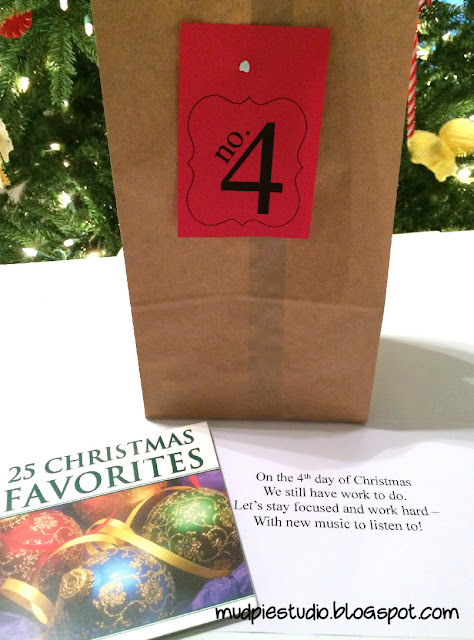 This poem explained to the class that they’d get one bag each day leading up to Christmas break. Day 2 included a holiday DVD I found for $5 at Target. 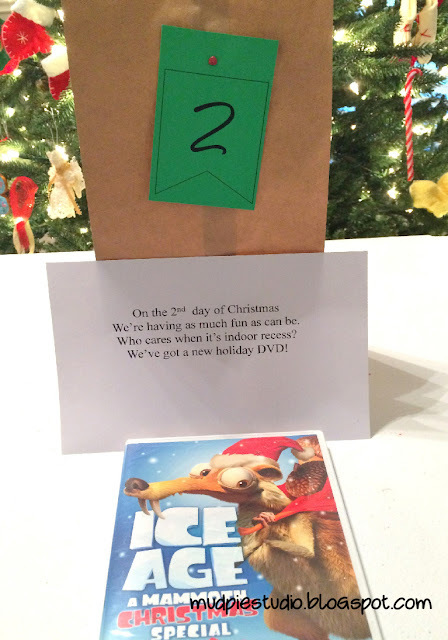 It just happens to be my kids’ favorite holiday movie so I can vouch for it as I’ve seen it many, many times … and it’s a winner! 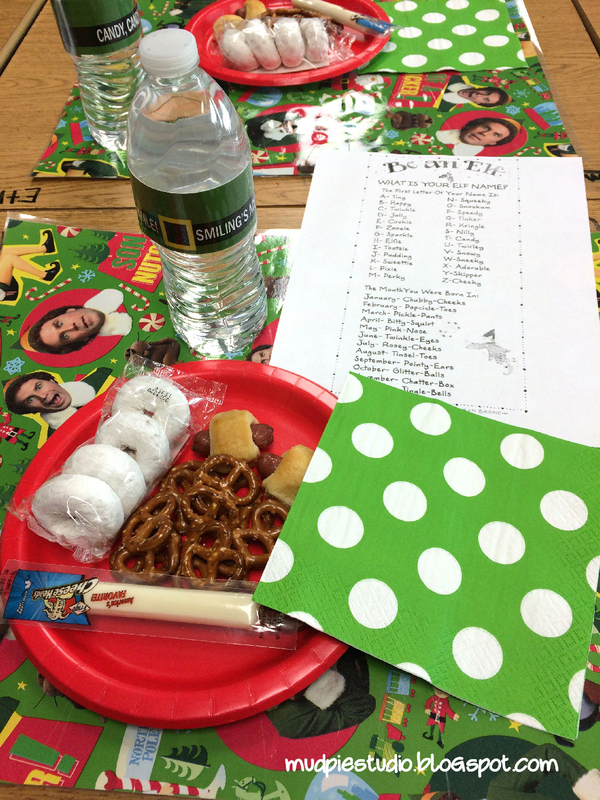 Day 3 - Probably my favorite day because it gave me the idea of throwing an Elf-themed party for the class. 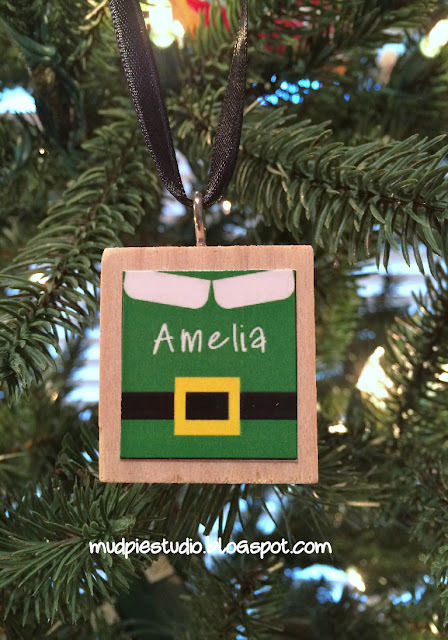 I had a bunch of wooden squares in my craft stash, so I made elf labels with the kid’s names on them and glued them to the squares. Then I put an eyelet screw in each and tied ribbon on them for hanging. 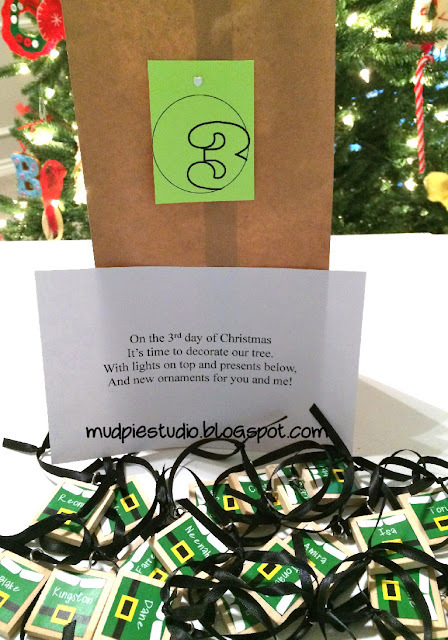 The kids put them on the classroom Christmas tree and took them home the last day of school. Day 4 – This sack contained a classical CD that the kids listen to while they’re working. They love the background music. I picked this up in the Walmart value bin for around $5. 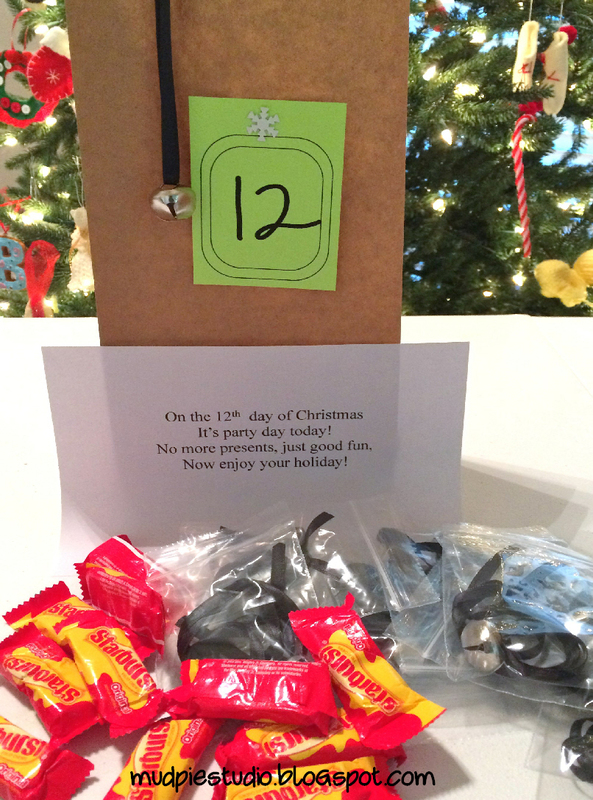 Day 5 – Time for another Halloween candy destash on day 5. I tried to spread out the sugar days for the sake of the teacher. ha! 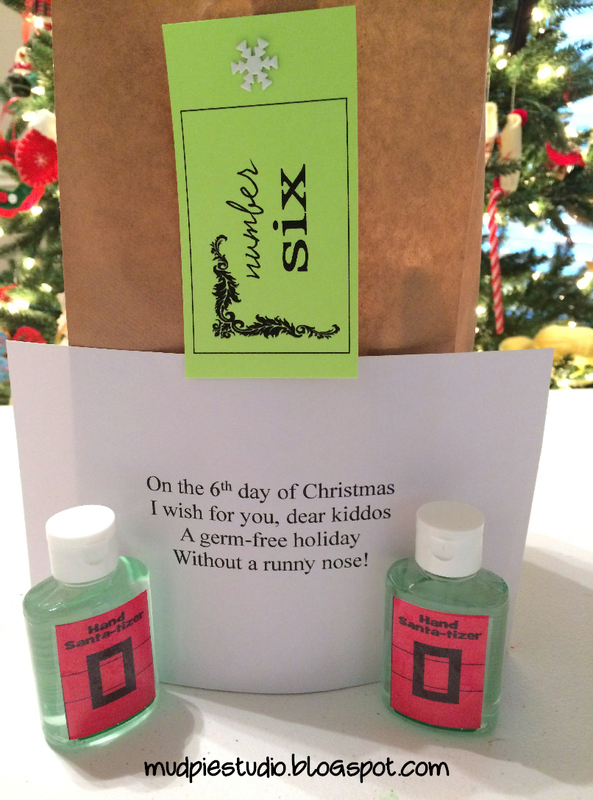 Day 6 – This sack had purse size hand sanitizers with these labels that say “Hand Santa-tizer”. 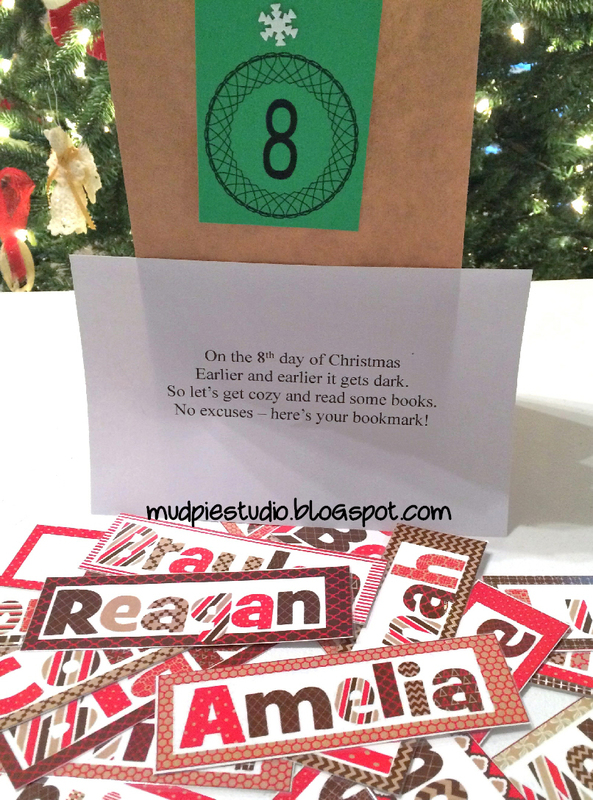 These are available 3/$1 at Dollar Tree. I was able to use up a bunch I still had from a previous project. Day 7 – I picked up a Christmas Madlibs at a discount store for $2 and there were 24 sheets in it. That way each student got to have one, or they could do them as a class. Day 8 – I made custom bookmarks for all the students, but you could easily pick up holiday or fun bookmarks at Dollar Tree or Mardel. Let’s face it, what kid doesn’t like something with their name on it?! The teacher sent me a note that she LOVED the bookmarks. Day 9 – Christmas pencils are a staple at any class Christmas party. They’re cheap and everyone loves school supplies. I picked up 12/$1 at Dollar Tree. 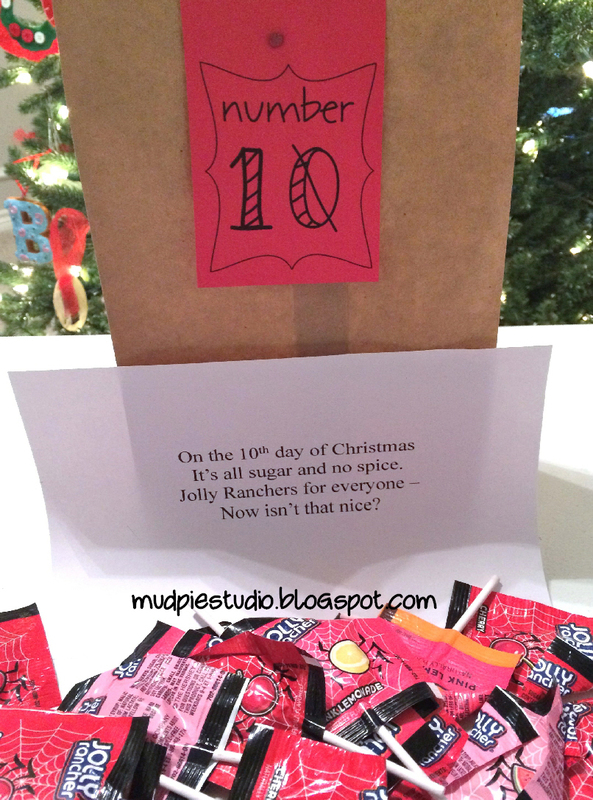 Day 10 – Halloween destash of Jolly Rancher suckers. 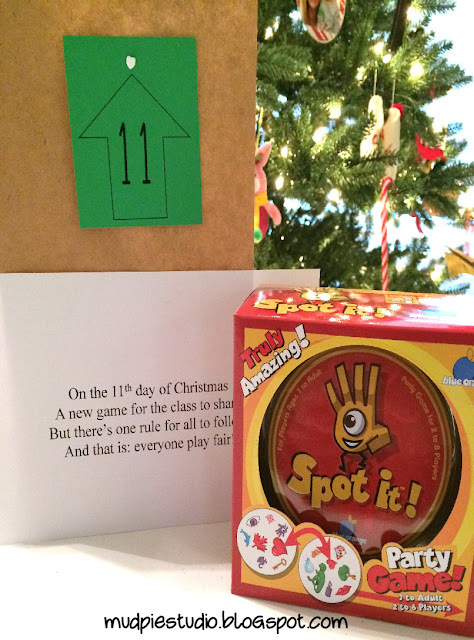 Day 11 – In this bag was a Spot It game for the class to share. I struggled with what game to get but ultimately settled on this because 1) all the cards go in the tin so it’s easy to keep track of 2) no small pieces or dice 3) no batteries required 4) several kids can play at once 5) the games are quick and varied so they can be played in a short time (like indoor recess or Friday Fun Day) 6) good for boys AND girls and 7) it’s FUN! There are several different themed versions of Spot It, but I chose the original. It’s about $10 at Target or Walmart. 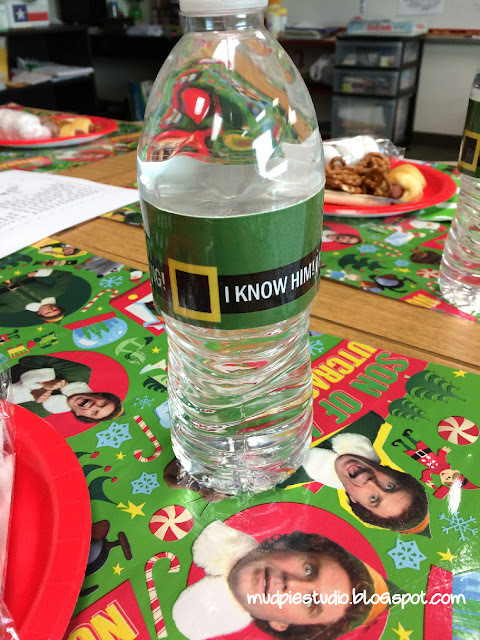 Day 12 – This was actually the day we had the class Christmas party, so I originally wasn’t going to put anything in the bag other than the poem saying it was party day. Then I decided to destash (surprise) some jingle bells I have in my craft stash. I thread black ribbon through each one and everyone got a festive necklace to wear on party day. =) I know the pic shows Starbursts, but since I knew there would be lots of sweets this day, I ended up leaving those out of the bag. 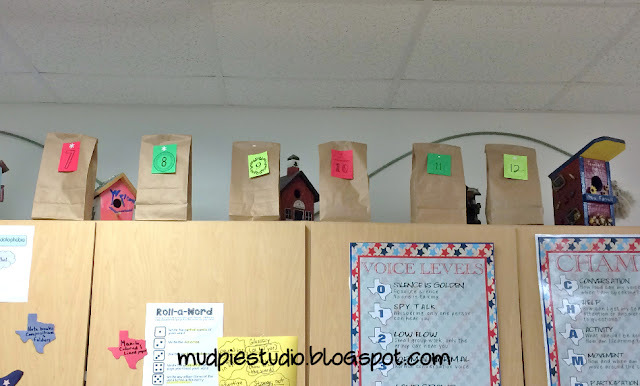 The teacher put the bags up high on the cabinet and each day a different student got to get one down, read the poem, and hand out the goods. 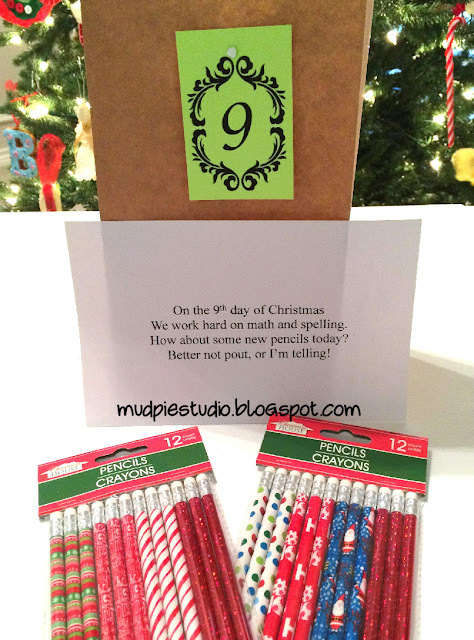 Hope you liked my 12 Days of Christmas for the Classroom! 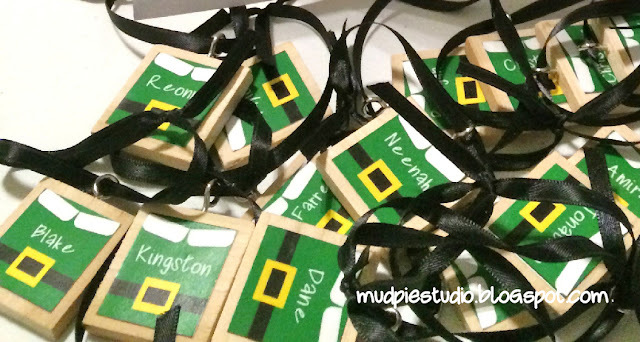 Check out my next post for the Elf-themed class party! 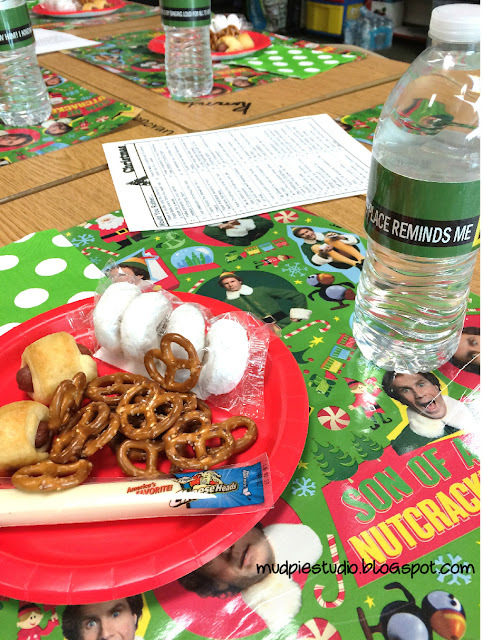 This year, our PTA theme is classic board games and we kicked off the year with a Back to School breakfast for the entire staff. These Hungry Hungry Hippos greeted teachers at the break fast buffet. I re-used the hippos later for a teacher’s “Hungry For Hard Workers” bulletin board. We served yogurt parfaits with vanilla yogurt, strawberries and granola. Click the photos for larger photos to see the Monopoly food labels. We served 4 different danish flavors and 4 different bagel flavors with various spreads, too. We served three donuts on a skewer – serving this way helps to make sure there’s enough for everyone. Three years ago I did this banana breakfast for teachers the first week of school and it was such fun I decided to do it again. I wrote fun messages on all of the bananas. It’s funny to watch teachers pick a banana based on what it says! For centerpieces, I opted to just use stacked games. Each centerpiece was 3-4 different games stacked up – enough for a little height but not so big they were in the way. In between the stacked games, I put paper sacks that were decorated to look like dominoes. The sacks added color, height and were very inexpensive to make. Hope you get some good ideas for when you’re hosting a teacher event!